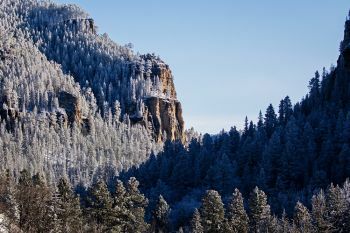 Winter solstice light in Spearfish Canyon. 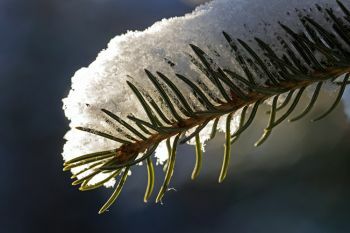 Late afternoon light on the snow covered pines. The view near Savoy in Spearfish Canyon. 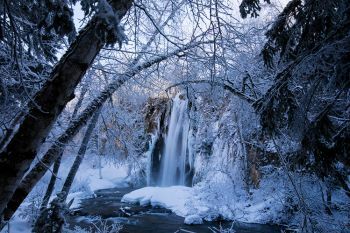 Spearfish Falls adorned in winter stylings. 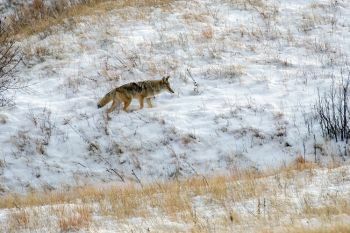 Coyote hunting at Wind Cave National Park. 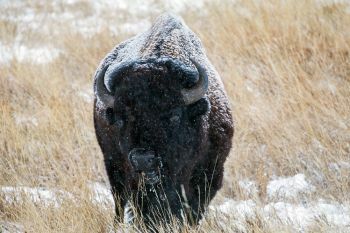 Bison grazing at Custer State Park. 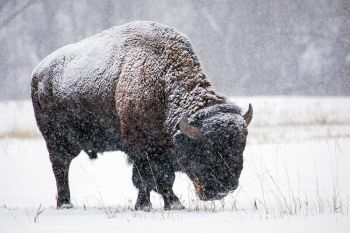 Focusing on the snowfall in front of the bison. 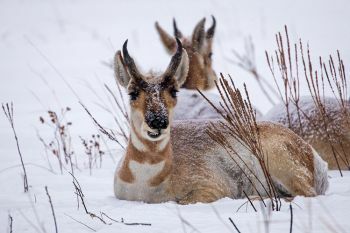 Pronghorn seemingly unfazed by the snow and cold at Custer State Park. Heavier snowfall near French Creek. 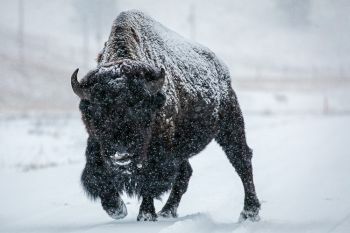 Snowfall on bison bull at Custer State Park. 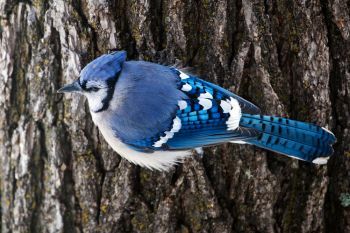 Blue jay posing near Grace Coolidge Creek. 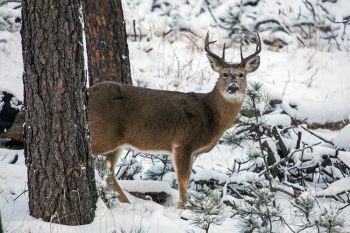 White-tail buck on the Black Hills Playhouse road. State Game Lodge Chapel at Custer State Park. A couple weeks ago I wasn’t sure this column was going to happen. Since October I had planned on taking the full week off before Christmas to spend some time in the Black Hills, camera in hand. Early winter in the Hills is a magical time. 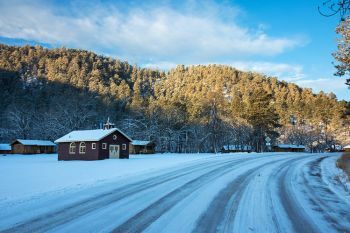 Fresh snow, active wildlife and very few people make great reasons to wander places like Spearfish Canyon, Wind Cave National Park and Custer State Park. 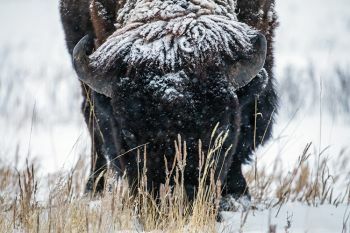 This year, however, things were looking grim for a peaceful vacation in mid-December when little to no snow was on the ground and the massive Legion Lake Fire was tearing through Custer State Park and portions of Wind Cave National Park. 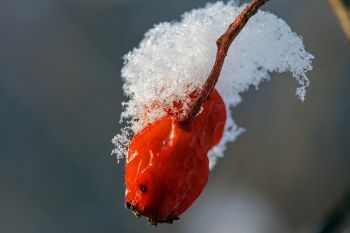 Thankfully, through great work by local and regional firefighting teams and some much-needed snowfall, the fire abated and the parks re-opened just days before my scheduled arrival. I was nervous about what I might see as I arrived on the evening of Dec. 21. I had spent the majority of the day in the Northern Hills waiting for the snow to end, and then cruising Spearfish Canyon as the sunlight broke free of the clouds and danced along the high ridgeline. The play of light and shadow through one of our state’s most scenic byways was worth the trip by itself. By the time I arrived in Custer State Park it was nearly dark, and I could smell the faint odor of burned grass and timber, but otherwise all was quiet and peaceful. The next morning, I accidently turned off my alarm when attempting to hit the snooze button, so I missed my planned rendezvous with the sunrise. But the morning was not lost. Just outside the window of my room at the Creekside Inn a flock of nearly 30 blue jays were calling, flying and digging in the snow. Beyond the creek a lone deer crossed the road. 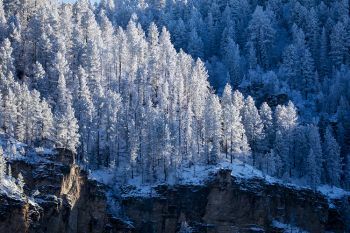 On the flanks of the far ridge, a flock of wild turkeys slowly made its way eastward and at the top of the same ridge, the early morning sunshine began to kiss the tops of the snow-covered ponderosa pine. It slowly enveloped the entire ridge as it chased away the blue-tinted shadows with warm, yellow-hued light. The scene before me was truly a winter wonderland. It was a special kind of peace and quiet that I think only the Black Hills can provide. Later that morning, I made the rounds on my favorite park roads looking for wildlife and trying to measure the extent of the fire damage. Enough snow had fallen to cover the blackened ground and singed trees, so I had to look closely to spot fire damage. About mid-afternoon, snow-laden clouds rolled in from the north and west. I found a group of old bison bulls along the southern curves of the Wildlife Loop road, and those same clouds let loose. 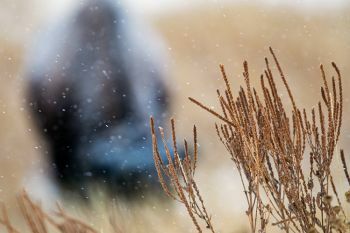 While taking bison portraits, my camera and I both had a hard time finding true focus through the snowflakes. 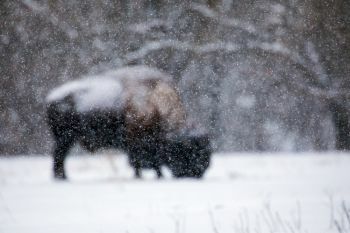 Even so, the out-of-focus shots were cool too, showing the extent of the snowfall with the bison silhouetted in the background. As I was leaving the park on Dec. 23, I stopped at the Game Lodge chapel to snap a photo. Just a week before, I had seen an image on social media showing the fire line behind the chapel and cabins. Now the whole valley and park lay under a peaceful blanket of snow. 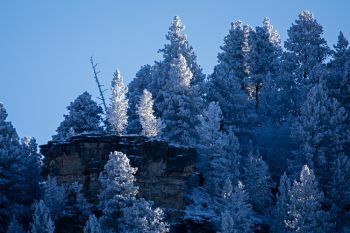 The fires were out and the beauty and peace of winter in the Black Hills had once again fallen over the landscape. All seemed right again — at least for now. Well done as always, my friend! Love your pictures. We had visited the Deadwood area about a week before you did. 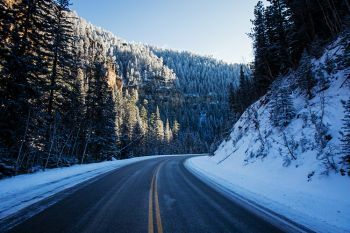 There was a light snow falling on the day we drove through Spearfish Canyon. I've never seen it look so beautiful as it did that day!